Unsure window designs that work. 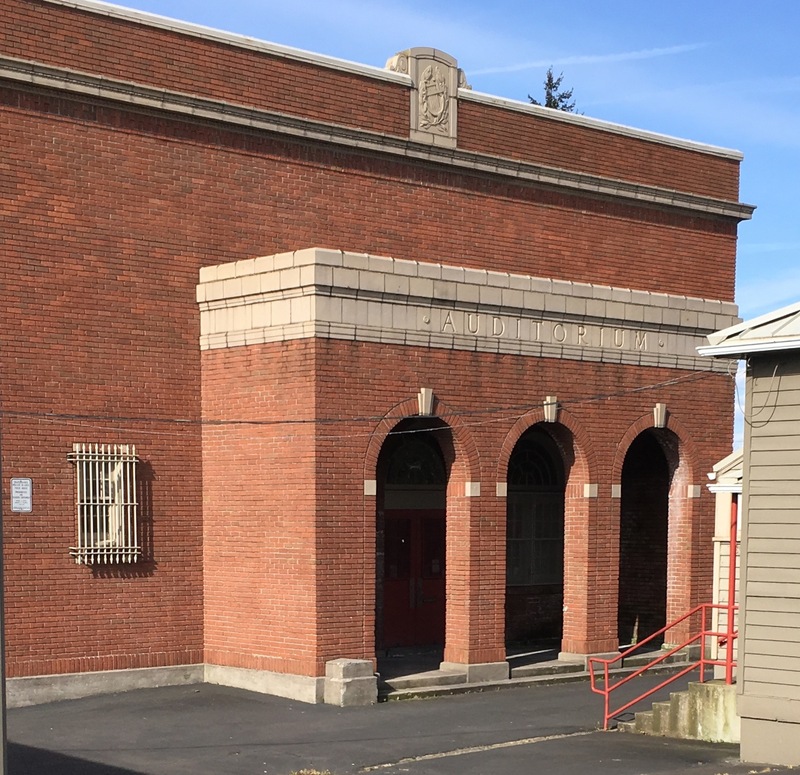 Sure there’s plenty to be concerned about with the future of education but I’ve been thinking about the schools of tomorrow and whether all the charm and cool characteristics of Portland’s old schools will one day be wiped out. My guess is that new schools built from scratch will reflect our current fast and cheap world of building practices. Schools are more likely to resemble big box stores than the traditional schools of yesteryear. Maybe not even a real gargoyle. 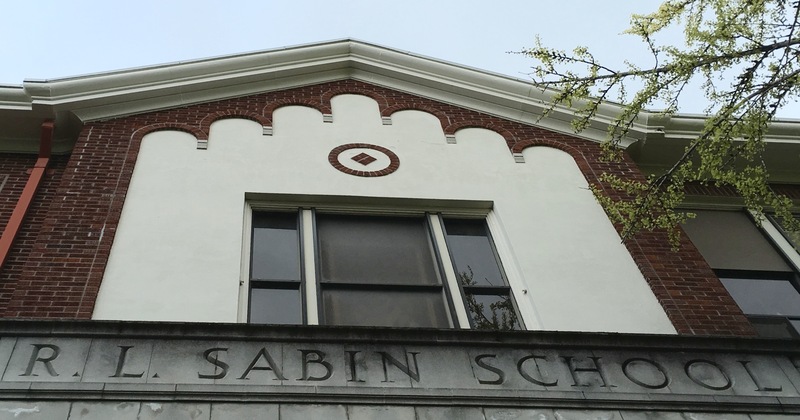 Schools in Portland have decorative elements that are cool in their subtly. 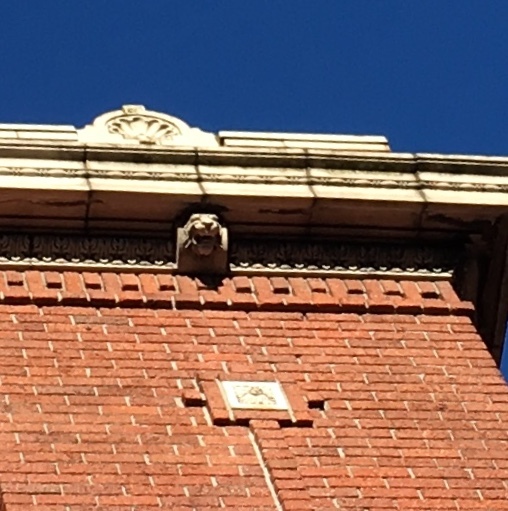 These are things that students might not notice for years until one day they begin to wonder about the concrete designs up near the roof line or they spot a lion head gargoyle and point it out to a classmate. I am no student of architecture. I’ve have seen enough schools in the district to have the opinion that when new schools are built an effort should be made to keep things interesting inside and out. I work with elementary school children which has had me wondering what the kids that surround me will remember about their school experience. There may not be much to recall about what their school looked like. This theory is based on my own murky memories of my first school, Jolly Elementary in Clarkson, Georgia. It was your basic, boxy, one story, red brick building. 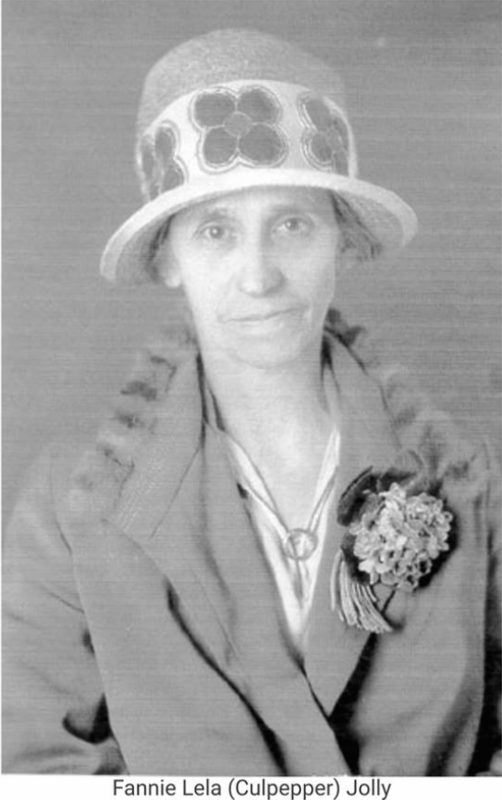 The only memorable thing was a large, framed photograph of Mrs. Tom Jolly, the school’s namesake sitting on an easel in the main lobby. I couldn’t have told you a thing about her then. No one at the school ever talked her up. I didn’t know her first name or why she was the school’s namesake. The picture of an ancient woman haunted me every time I saw it. It wasn’t until recently that I found out what she did to help educate children in her community and what made her worthy of having a school named after her. My point here is give kids something to remember about their school. This really is one of those they don’t make ‘em like they used to pieces. Back in the day delicate design accents were included in schools. 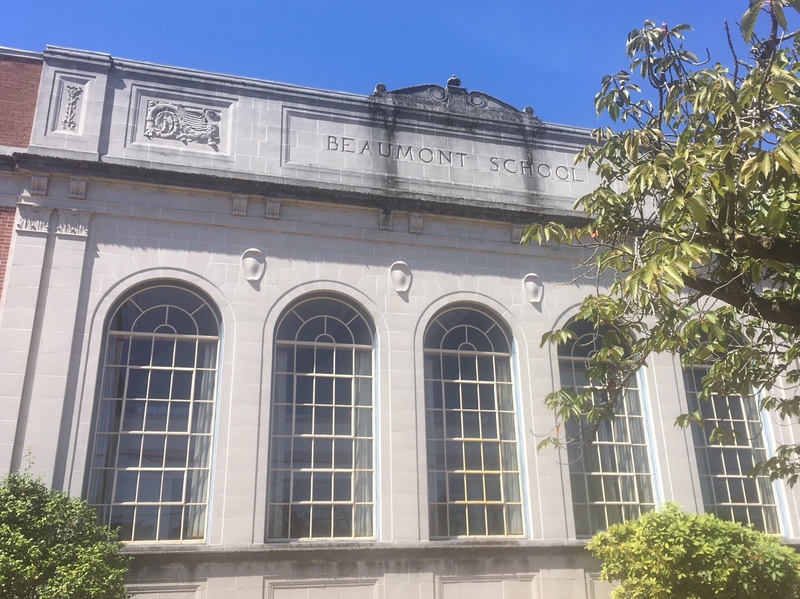 Souped up windows, columns, carvings, latin phrases inscribed in concrete and Roman numerals appeared on schools. You could almost imagine kids of that era speaking Latin as a second language and maybe knowing their Roman numerals. I appreciate subtle architecture elements in school’s exteriors knowing it creates a better educational environment, if only on a subconscious level, that might inspire students somehow. 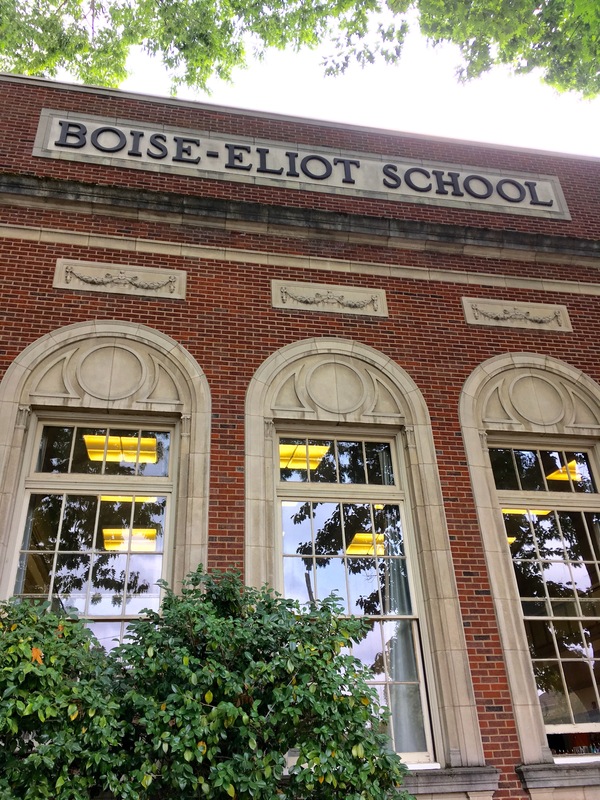 It’s the least the older schools in Portland have to offer. Old schools with over the top window designs still look great. They might combine these looks with concrete doohickies (not an architectural term, I know) as well as cravings and fake columns that border huge windows. One day, while substitute teaching, I noticed a malt liquor can in the well of the faux balcony. I never did get around to letting the janitorial staff know but it seemed out of place. What about these faux balconies? Sadly I have no picture to illustrate this but when would you ever need a balcony at a school? 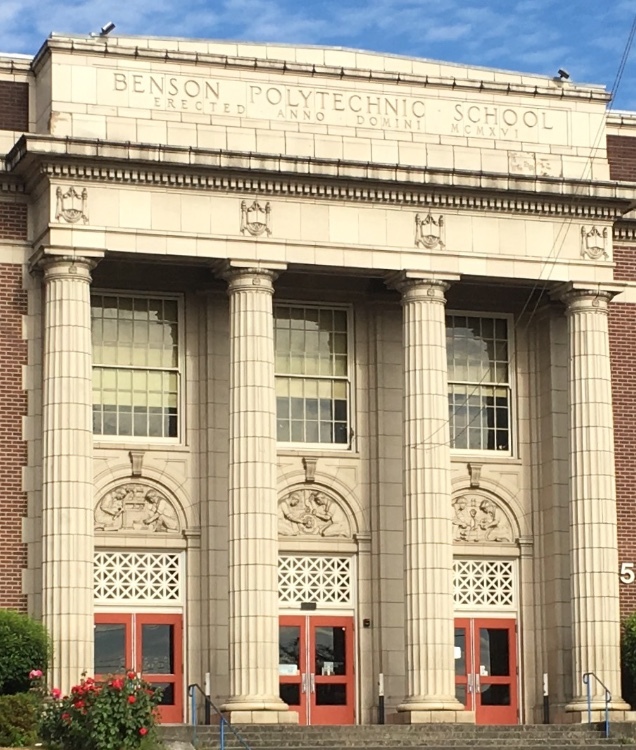 I always loved the entrance to Benson Polytechnic along with the name of the school as I’m a graduate of a Polytechnic Institute. The front doors seem epic with real looking columns. I was supposed to learn in school whether they’re doric or ionic but at times like these it’s of no significance and not even worth looking up. They are gorgeous. If I had gone to that school I would have worn a toga regardless of whether it was allowed according to the school’s dress code. I would have been proud to enter that school every day but it’s more likely this facade would have been so distracting that I would have hung around the columns for much of my class time never learning the difference between doric and ionic columns. This way to the auditorium. The Kenton School, now De La Salle, was built over 100 years ago. It’s further proof of what was done right then. Concrete carvings, a nice entrance and the labeling of certain buildings like the auditorium are all admirable design offerings. 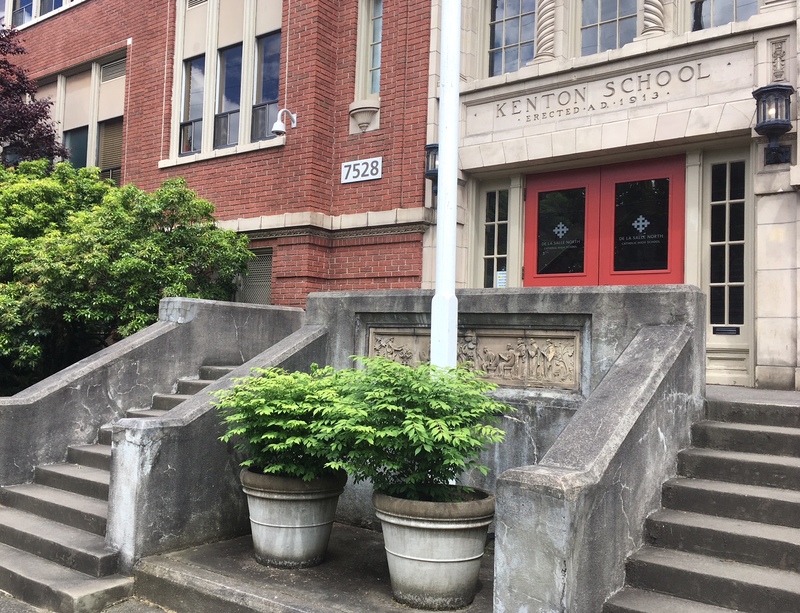 The old Kenton School with planters. This school has nice concrete trim around the windows and roof along with it’s own school crest and a mysterious lion gargoyle that proved challenging to photograph. Announcing to the world that the school was erected in 1913 probably opens itself up to a preponderance of sophomoric jokes and would not be the type of thing that would appear on a school building these days. Every school needs a crest. 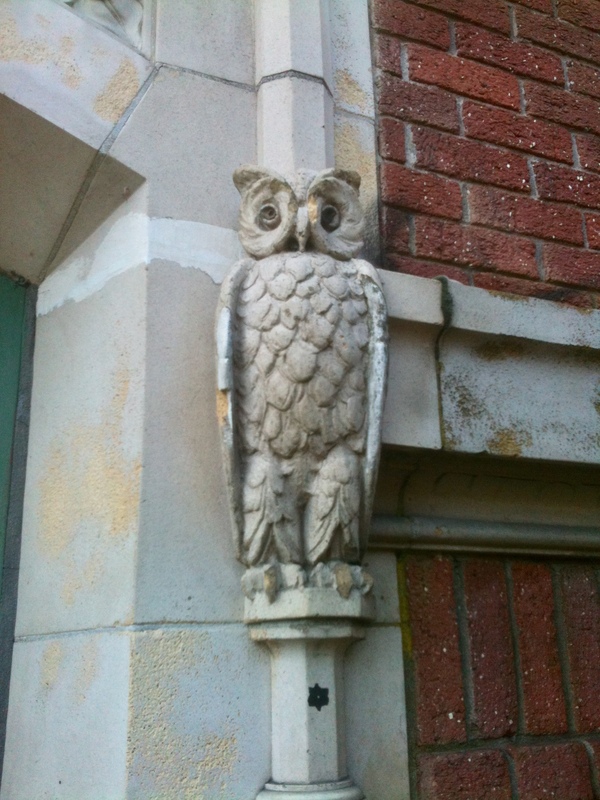 One of the Kellogg School owls. 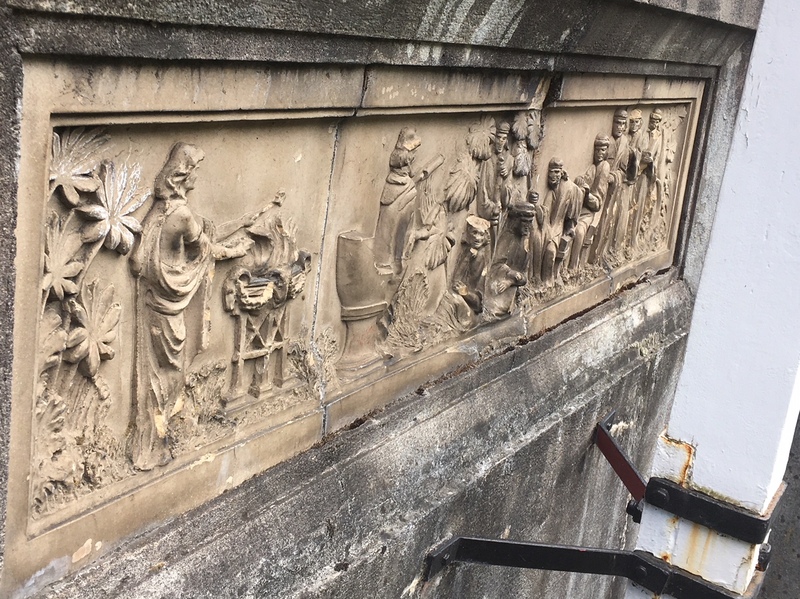 To anyone designing and building schools in Portland make the effort to create a bit of mystery and decorative work in schools that will help students thrive. 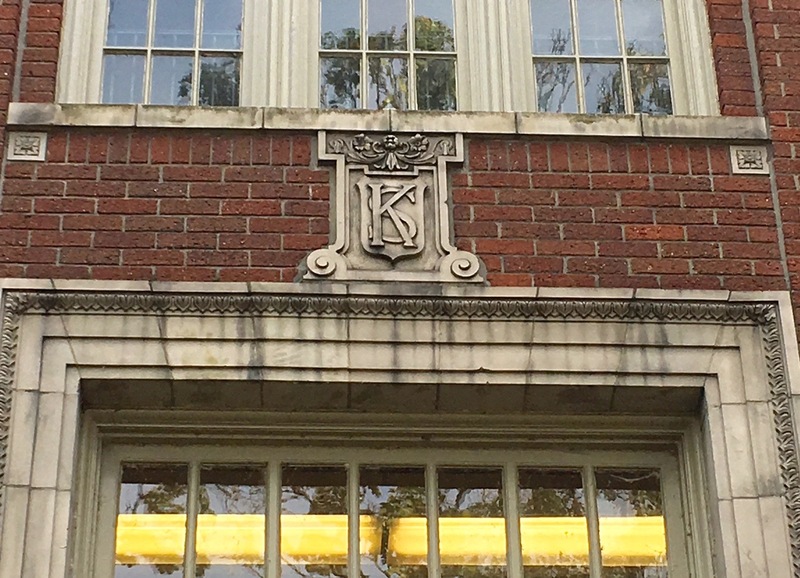 Keep alive the spirit of intrigue that still exists in Portland schools today through the use of artistic masonry. Something like the Kellogg School owls outside one of the doorways would might seem like something insignificant, but it has possibility of making kids feel special like their school is a unique and wondrous place. Kenton School detail: Lined up to learn. Excellent scene report! Keep kicking it Tony R. Boise-Eliot!